IN THE FIRST OF THREE ARTICLES focussing on topics to be featured at this year’s breast cancer forum at the Royal Society of Medicine – see https://tinyurl.com/y8j5vn94 – and the relevant library resources available to visitors to RSM, professor D Gareth Evans looks at the field of breast cancer genetics, and introduces recent work. THE importance of genetics in relation to breast cancer predisposition and treatment has accelerated in recent years. 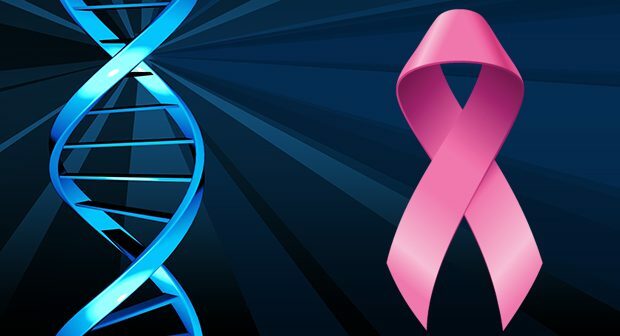 The discovery of the two most important breast cancer predisposition genes BRCA1 and BRCA2 in 1994 and 1996 was followed by relatively lean years where only a few additional genes were found (notably ATM, CHEK2 and PALB2). Since 2009 the undertaking of largescale Genome Wide Association Studies (GWAS) has now identified in excess of 200 common genetic variants called Single Nucleotide Polymorphisms (SNPs) associated with breast cancer risk. We can now divide predisposition into high risk usually rare dominantly inherited genes (BRCA1, BRCA2, TP53) that confer >40% lifetime risk of breast cancer when a disease causing variant is present in women, moderate risk (20-35% lifetime) with usually slightly more common genes (CHEK2, ATM) and low risk variants associated individually with only small increases or decreases. However, when these are multiplied together in a polygenic risk score (PRS) they can increase risk to as high as 30% or reduce to only 3-4%. In addition to the risk of breast cancer conferred by different genes these may also increase other cancer risks such as prostate, ovary and pancreas. New breeds of drugs have also been developed to treat individuals with defective BRCA1 and BRCA2 genes in their tumours, most notably PARP inhibitors that are likely to be licensed for treatment of breast cancer in 2018. The Royal Society of Medicine Library provides a recent resource of publications that are in this area of research. They document the risks from the various genes and how they can be used to predict cancer risk as well as models that have been developed to predict the likelihood of a BRCA1 or BRCA2 gene fault. They also document changes in the tumours themselves which may impact treatment. It is worth exploring the resource if you are interested in the genetics of breast cancer. POWERS, B., PAL, T. and LARONGA, C., 2018. Considerations in Testing for Inherited Breast Cancer Predisposition in the Era of Personalized Medicine. Surgical oncology clinics of North America, 27(1), pp. 1-22. Full-text available from the RSM Library e-journals collection. BAYRAKTAR, S. and ARUN, B., 2017. BRCA mutation genetic testing implications in the United States. Breast, 31, pp. 224-232. KADALAYIL, L., KHAN, S., NEVANLINNA, H., FASCHING, P.A., COUCH, F.J., HOPPER, J.L., LIU, J., MAISHMAN, T., DURCAN, L., GERTY, S., BLOMQVIST, C., RACK, B., JANNI, W., COLLINS, A., ECCLES, D. and TAPPER, W., 2017. Germline variation in ADAMTSL1 is associated with prognosis following breast cancer treatment in young women. Nature Communications, 8(1), pp. 1632. TER HOEVE, N.D., MOELANS, C.B., SCHRIJVER, W.A.M.E., DE LENG, W. and VAN DIEST, P.J., 2017. Molecular diagnostics in breast cancer routine practice. European Oncology and Haematology, 13(1), pp. 74-79. EHSANI, S. and WISINSKI, K.B., 2017. Genomic testing in the management of early-stage breast cancer. Journal of Clinical Outcomes Management, 24(5), pp. 229-238. NIK-ZAINAL, S. and MORGANELLA, S., 2017. Mutational Signatures in Breast Cancer: The Problem at the DNA Level. Clinical cancer research : an official journal of the American Association for Cancer Research, 23(11), pp. 2617-2629. EVANS, D.G., BRENTNALL, A., BYERS, H., HARKNESS, E., STAVRINOS, P., HOWELL, A., NEWMAN, W.G., CUZICK, J., ASTLEY, S., WILSON, M., FRENCH, D., HARVIE, M., WATTERSON, D., FOX, J., SAMPSON, S., INGHAM, S., SAHIN, S. and FOX, L., 2017. The impact of a panel of 18 SNPs on breast cancer risk in women attending a UK familial screening clinic: A case-control study. Journal of medical genetics, 54(2), pp. 104-110. TOMASETTI, C., LI, L. and VOGELSTEIN, B., 2017. Stem cell divisions, somatic mutations, cancer etiology, and cancer prevention. Science, 355(6331), pp. 1330-1334. KEENEY, M.G., COUCH, F.J., VISSCHER, D.W. and LINDOR, N.M., 2017. Non-BRCA familial breast cancer: review of reported pathology and molecular findings. Pathology, 49(4), pp. 363-370. APOSTOLOU, P. and PAPASOTIRIOU, I., 2017. Current perspectives on CHEK2 mutations in breast cancer. Breast cancer (Dove Medical Press), 9, pp. 331-335. LECARPENTIER, J., KUCHENBAECKER, K.B., BARROWDALE, D., et al, 2017. Prediction of breast and prostate cancer risks in male BRCA1 and BRCA2 mutation carriers using polygenic risk scores. Journal of Clinical Oncology, 35(20), pp. 2240-2250. ROMERO-LAORDEN, N. and CASTRO, E., 2017. Inherited mutations in DNA repair genes and cancer risk. Current problems in cancer, 41(4), pp. 251-264. CINTOLO-GONZALEZ, J., BRAUN, D., BLACKFORD, A.L., MAZZOLA, E., ACAR, A., PLICHTA, J.K., GRIFFIN, M. and HUGHES, K.S., 2017. Breast cancer risk models: a comprehensive overview of existing models, validation, and clinical applications. Breast cancer research and treatment, 164(2), pp. 263-284. Published erratum in: Breast cancer research and treatment, 2017, 164(3), pp. 745. EVANS, D.G., WOODWARD, E.R., HOWELL, S.J., VERHOEF, S., HOWELL, A. and LALLOO, F., 2017. Risk algorithms that include pathology adjustment for HER2 amplification need to make further downward adjustments in likelihood scores. Familial Cancer, 16(2), pp. 173-179. DAVIES, H., GLODZIK, D., MORGANELLA, S., et al, 2017. HRDetect is a predictor of BRCA1 and BRCA2 deficiency based on mutational signatures. Nature medicine, 23(4), pp. 517-525. KUCHENBAECKER, K.B., HOPPER, J.L., BARNES, D.R., et al, 2017. Risks of Breast, Ovarian, and Contralateral Breast Cancer for BRCA1 and BRCA2 Mutation Carriers. JAMA, 317(23), pp. 2402-2416. YANG, S., YANG, S., WANG, D., CHEN, X., SHEN, H., ZHANG, X., ZHONG, S., TANG, J. and ZHAO, J., 2017. The miR-30 family: Versatile players in breast cancer. Tumor Biology, 39(3), pp. 1010428317692204. KUROZUMI, S., YAMAGUCHI, Y., KUROSUMI, M., OHIRA, M., MATSUMOTO, H. and HORIGUCHI, J., 2017. Recent trends in microRNA research into breast cancer with particular focus on the associations between microRNAs and intrinsic subtypes. Journal of human genetics, 62(1), pp. 15-24. ROUSSET-JABLONSKI, C. and GOMPEL, A., 2017. Screening for familial cancer risk: Focus on breast cancer. Maturitas, 105, pp. 69-77. FREY, J.D., SALIBIAN, A.A., SCHNABEL, F.R., CHOI, M. and KARP, N.S., 2017. Non-BRCA1/2 Breast Cancer Susceptibility Genes: A New Frontier with Clinical Consequences for Plastic Surgeons. Plastic and reconstructive surgery.Global open, 5(11), pp. e1564. HAMDI, Y., SOUCY, P., KUCHENBAEKER, K.B., et al, 2017. Association of breast cancer risk in BRCA1 and BRCA2 mutation carriers with genetic variants showing differential allelic expression: identification of a modifier of breast cancer risk at locus 11q22.3. Breast cancer research and treatment, 161(1), pp. 117-134. O’QUIGLEY, J., 2017. Faulty BRCA1, BRCA2 genes: how poor is the prognosis? Annals of Epidemiology, 27(10), pp. 672-676. SLAVIN, T.P., MAXWELL, K.N., LILYQUIST, J., VIJAI, J., NEUHAUSEN, S.L., HART, S.N., RAVICHANDRAN, V., THOMAS, T., MARIA, A., VILLANO, D., SCHRADER, K.A., MOORE, R., HU, C., WUBBENHORST, B., WENZ, B.M., D’ANDREA, K., ROBSON, M.E., PETERLONGO, P., BONANNI, B., FORD, J.M., GARBER, J.E., DOMCHEK, S.M., SZABO, C., OFFIT, K., NATHANSON, K.L., WEITZEL, J.N. and COUCH, F.J., 2017. The contribution of pathogenic variants in breast cancer susceptibility genes to familial breast cancer risk. NPJ breast cancer, 3, pp. 22. Published erratum in: NPJ breast cancer, 2017, 3, pp. 44. COPSON, E.R., MAISHMAN, T.C., TAPPER, W.J., CUTRESS, R.I., GREVILLE-HEYGATE, S., ALTMAN, D.G., ECCLES, B., GERTY, S., DURCAN, L.T., JONES, L., EVANS, D.G., THOMPSON, A.M., PHAROAH, P., EASTON, D.F., DUNNING, A.M., HANBY, A., LAKHANI, S., EELES, R., GILBERT, F.J., HAMED, H., HODGSON, S., SIMMONDS, P., STANTON, L. and ECCLES, D.M., 2018. Germline BRCA mutation and outcome in young-onset breast cancer (POSH): a prospective cohort study. The Lancet.Oncology, 19(2), pp. 169-180.